Shims are arranged in various combinations within the damping unit to achieve the desired results. Most applications use either a single-stage or two-stage stack. 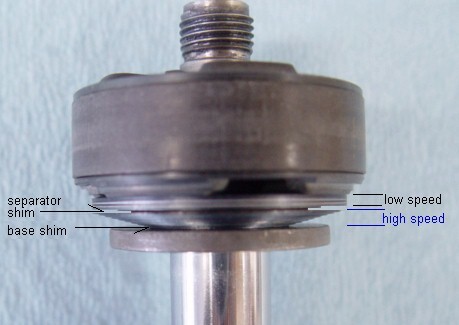 Most single stage stacks use a taper design starting with the largest diameter shim against the face of the piston, and stepping down in 1mm or 2mm increments. There may be more than one of the largest diameter shim against the face of the piston. 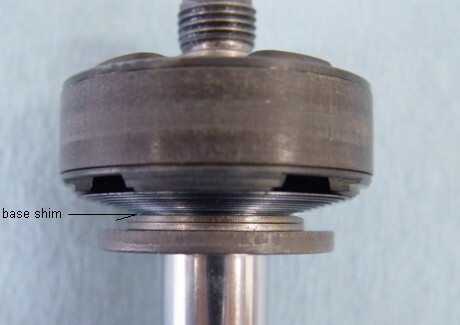 Two stage designs usually start with several shims of the largest diameter against the face of the piston, followed by a separator (or transition) shim. This top half of the stack is called the low speed stack. Below the separator shim is a tapered stack, similar to the single stage design. This half of the stack is call the high speed. The first shim of the high speed stack is usually the same diameter, or 2mm smaller than the low speed shims. The top half of the stack is called low speed, and the bottom half is called high speed because it's commonly thought that changes to the low speed shim stack affect the low speed damping range, and changes to the high speed shim stack affect the high speed damping range. Generally, this is not the case as we will demonstrate later. Low speed shim stack and low speed damping range. High speed shim stack and high speed damping range. Don't get the two mixed up. The low speed shim stack refers to the shims in the actual stack, and the low speed damping range refers to the actual stroking velocity and corresponding force numbers (later refereed to as the force-velocity curve). The top and bottom shim stacks have long been referred to as low and high speed stacks, so we will continue to use these terms. However, a more accurate description of the shim stacks would be the top stack and bottom stack since for the most part it's not that easy to specifically target their namesakes damping range.